The Spinnaker Tower viewing platform is an impressive 100 metres high and let me tell you that it seems even higher when you’re standing up there and looking down! - This was what was going through my mind when we were about to climb over the edge and start our descent. Incidentally, climbing over the edge was the most difficult part of the whole experience as all we were climbing onto was a thin ledge! From there, we just needed to courageously let go and trust the harnesses we’d been strapped into to hold us! Once we’d let go and let the rope take our weight, I decided it was probably best not to look down again and off we went. We were able to speak to each other on the way down and even did some singing to distract ourselves from the altitude! - It was really good fun. Apart from being blown around a little by a few strong gusts of wind, it was a smooth descent. As we neared the bottom, our friends and family below began singing “Happy birthday” to Hannah which was a really lovely moment. It only took a mere 12 minutes to complete and as we touched the ground I felt a great sense of achievement. 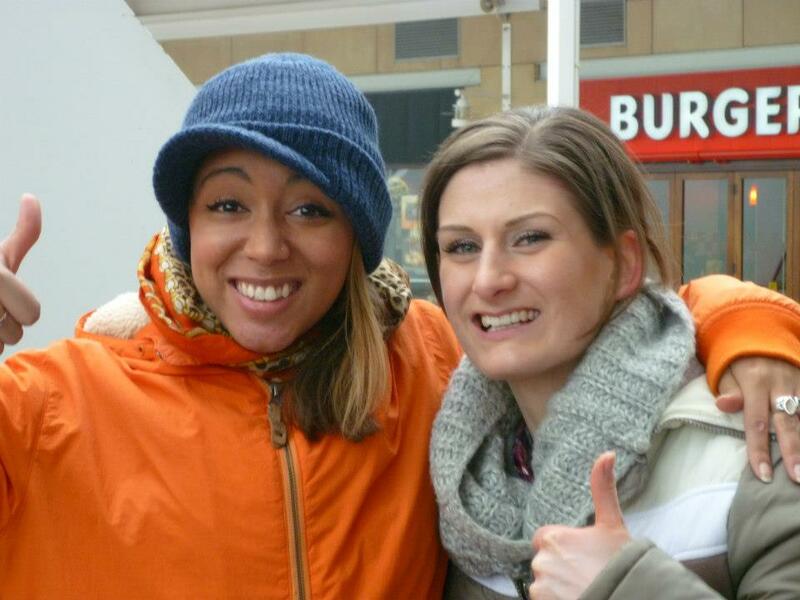 We had done it and thanks to all our sponsors, raised over £1000 for The Stroke Association! Dangling precariously from Portsmouth’s iconic Spinnaker Tower 100m off the ground was not how I would have expected to be spending my 27th birthday; but I have to say it was the best and most memorable one I’ve ever had. 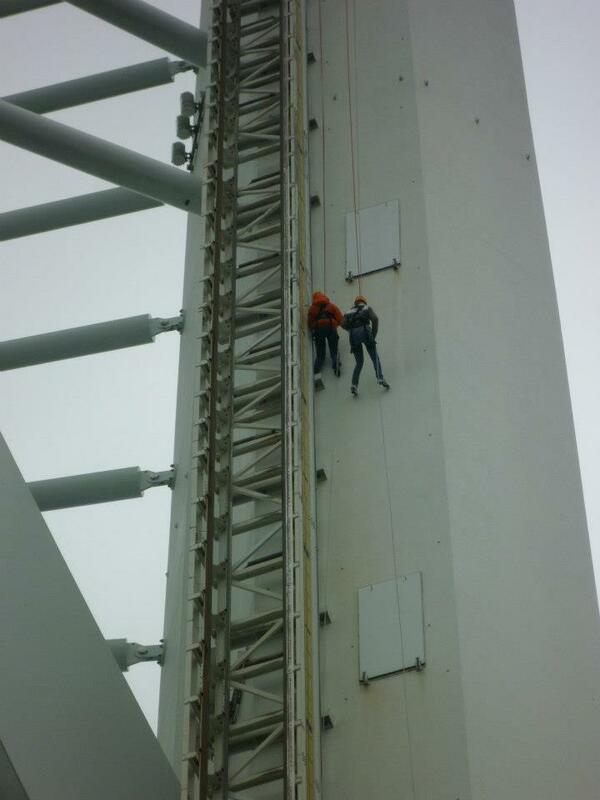 When Angela asked our office’ Does anyone fancy abseiling down the Spinnaker Tower for charity?’ I never pictured me being the one to go through with it! I’m certainly not famed amongst my friends for being particularly brave or thrill-seeking (you’re talking to the girl who cried on the magic carpet ride at Thorpe Park aged 21!! ); however when I discovered the charity was the Stroke Association, I knew I wanted to be a part of it. I was even further convinced when they told us that they had two spaces available on 23rd March – my birthday! It felt like it was meant to be. I can’t say I felt quite so convinced when I awoke on the morning of my birthday, but I decided to tell myself that the feeling in my stomach was that of excited butterflies, and not the nauseating sense of impending doom! Still riding on this wave of ‘excitement’, I arrived at the Spinnaker Tower all wrapped up (it was bitterly cold) and raring to go. I have to say that seeing Angela arrive wearing the same manic expression made me feel somewhat better. We took the lift to the viewing platform, accompanied by an instructor and two other abseilers. At this point I’d like to mention that Angela and I had been assured on various occasions that we would be ‘tethered to a professional at all times’ and a large part of our confidence that we could do this was rooted in this vital piece of information. Imagine our dismay when were told (as we stepped into our harnesses) that we would be going it alone!! Luckily they instructors said we could go down at the same time, as long as we made sure the ropes didn’t get tangled. Clinging to the knowledge that we were very much in this together, we proceeded to the start point of the abseil along with our companions. The starting platform resembled something like a plank on a pirate ship, a narrow space jutting out of the tower at 100m surrounded by ropes and cables; and I must admit that I did feel as though I might well be walking to my death as I carefully stepped out into the open air. I followed the instructions to the letter and said cheerfully to the instructor ‘I am absolutely terrified you know’ as I stepped over the barrier and was fully suspended from the tower. He assured me that it was quite safe, and sure enough as I let go of the handrail, I was happy to discover that I did not tumble to my death. He told me that I was the happiest abseiler he’d ever seen. And the grand total - although there is still a little to come in was (drum roll) £1200! !